You can optionally summarize and put together a bunch of data values in groups using various grouping options. 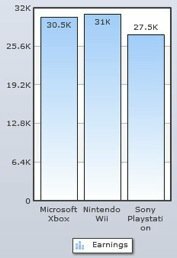 For example, in a data displaying the total earnings in three years for three products – XBOX, Playstation and Nintendo, you want to aggregate sales data across all 3 years for these 3 products. Select Enabling grouping of data check box. 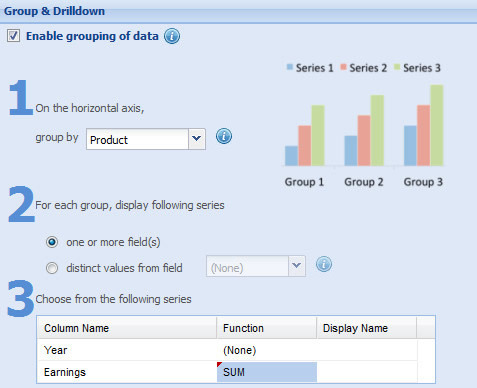 Select Product from the drop down list beside On the horizontal axis, group by. Select one or more field(s) radio button. 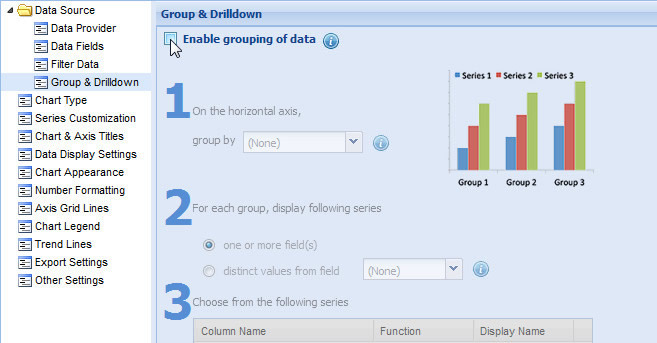 This enables you to group one or more columns. 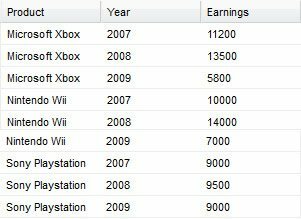 Select SUM grouping function beside the Earnings column name. SUM: Provides the total of all the values under a group. AVERAGE: Provides the average of all the values under a group. COUNT: Provides the count of all the values under a group. MIN: Provides the lowest of all the values under a group. MAX: Provides the highest of all the values under a group. You can further summarize data values using a specific part of any date like year, quarter, month, day, hour, minute or second. 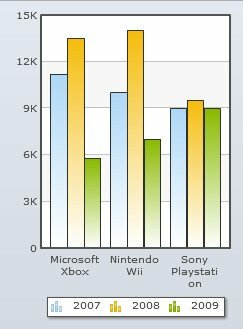 For example, you can summarize daily sales figures into year-wise sales data. Moreover, you can create multiple data columns from the distinct values present in a single column. You can create multiple data columns from the distinct values present in a single column. For example, in the given data, suppose you want to view the earnings of three different years. But year cannot be a series since different years are not individual columns in your data, but different values in a single column. Here you can split the Year column and display the total earnings of each product in three different years. Select the distinct values from field radio button and choose Year in the drop down list as the data series name. Select SUM function from the drop-down list under For each series, display option. Select Earnings series name from the drop-down list under For each series, display option. In the above chart, please note that each individual year is considered as a data series. Note: This setting works in combination with Group By option. Select a column having Date/Time values beside On the horizontal axis, group by. Select a part of date or time from the drop-down list beside where dates are grouped by the. The available options are Year, Month, Day, Hour, Minute and Second. Select a summarizing function (SUM, AVERAGE, COUNT, MIN or MAX) and apply to the columns provided in the table below Choose from the following series.